The behind the scenes of the 1971 prisoners revolt at the Attica prison. Harry Keach has been widowed for two years and works as a demolition crane operator on a demolition crew. During a blackout, a New York executive crosses paths with a Broadway actress and her husband. A woman is determined to reveal the truth about an insidious political corruption. In doing so she risks her safety, career and reputation but will not stop asking questions until the truth is known. Sam Singleton ... Brother Samuels ? This film is NOT about the last 24 hours of Malcolm X's life. It is a 'what if' fantasy that shows Malcolm walking around New York in the years following his death, relating to the black movements in America and abroad. One can tell this isn't about the actual last 24 hours of his life from countless details, such as hippies (that movement wouldn't start for well over a year after Malcolm's death) a bookseller (in a dashiki!) talking about the death of the Kennedy children and Martin, footage of black people in afros on a TV discussion program (with no white host - remember, Malcolm died in February of 1965! ), black FBI agents... the list goes on and on. The film takes liberties with history to make points about the impact Malcolm had, but such a form of storytelling can be dangerous, since obviously the one other reviewer here thought this film was an actual documentation of the last day of Malcolm's life. Who knows how many others think the same thing? I don't mind filmmakers taking such liberties, after all, one has a right to speak metaphorically about the 'prophet' Malcolm. But it's done in such a slipshod way. 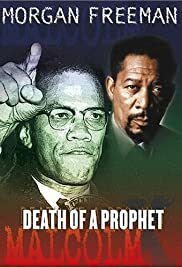 Morgan Freeman is one of my favorite actors but he portrays Malcolm as if he was made of stone: a dangerous thing when portraying a martyr. It's vital that people know that Malcolm was a flesh and blood human being. Everyone in this film though, is acting as if they were under extreme hypnosis. The whole film is lethargic, and will surely be confusing to those who don't know very much about the civil rights movement, or the independence movements throughout Africa. I guess for 1981, this film was better than nothing since Malcolm still hadn't been acknowledged by the film world (other than a documentary in 1972). But as long as one is going to watch a docudrama on Malcolm, skip this junk and watch Spike Lee's magnificent "Malcolm X". You'll get a much more focused, passionate, and correctly detailed account of the man and what it was that he stood for.